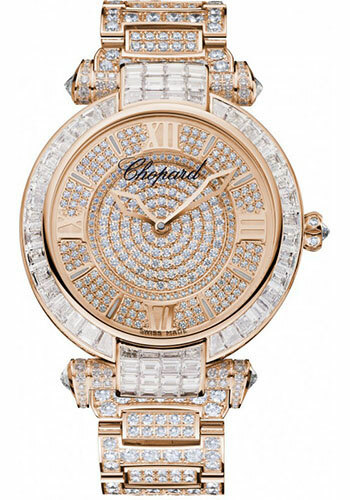 40mm 18K rose gold case, sapphire back, inverted diamonds end pieces, 18K rose gold crown, diamond bezel, diamonds set dial, Chopard 01.03-C automatic movement, approximately 60 hours of power reserve, 18K rose gold bracelet with diamonds, 18K white gold folding buckle. Water resistant to 50 meters. 40 mm 18K rose gold case with amethysts set in the lugs and crown, sapphire crystal back, mother of pearl dial, automatic self-winding movement with hours, minutes, seconds, and date, approximately 42 hours of power reserve, brown leather strap. Water resistant to 50 meters. 40 mm 18K rose gold case with amethysts set in the lugs and crown, sapphire crystal back, mother of pearl dial, automatic self-winding movement with hours, minutes, seconds, and date, approximately 42 hours of power reserve 18K rose gold bracelet. Water resistant to 50 meters. 40 mm 18K rose gold case with amethysts set in the lugs and crown, sapphire crystal back, diamond bezel, mother of pearl dial, automatic self-winding movement with hours, minutes, seconds, and date, approximately 42 hours of power reserve, brown leather strap. Water resistant to 50 meters. 40 mm 18K rose gold case with amethysts set in the lugs and crown, sapphire crystal back, diamond bezel, mother of pearl dial, automatic self-winding movement with hours, minutes, seconds, and date, approximately 42 hours of power reserve 18K rose gold bracelet. Water resistant to 50 meters. 40.00mm 18K rose gold case, sapphire back, 18K rose gold crown, brown dial with Roman numerals, Chopard 01.01-C automatic movement with hours, minutes, seconds, and date, approximately 60 hours of power reserve, brown glossy alligator strap, pin buckle in 18K rose gold. Water resistant to 50 meters. 40.00mm 18K rose gold case, sapphire back, 18K rose gold crown, brown dial with Roman numerals, Chopard 01.01-C automatic movement with hours, minutes, seconds, and date, approximately 60 hours of power reserve, 18K rose gold bracelet. Water resistant to 50 meters. 40.00mm 18K rose gold case set with diamonds, sapphire back, 18K rose gold crown, brown dial with Roman numerals, Chopard 01.01-C automatic movement with hours, minutes, seconds, and date, approximately 60 hours of power reserve, brown glossy alligator strap, pin buckle in 18K rose gold. Water resistant to 50 meters. 40.00mm 18K rose gold case set with diamonds, sapphire back, 18K rose gold crown, brown dial with Roman numerals, Chopard 01.01-C automatic movement with hours, minutes, seconds, and date, approximately 60 hours of power reserve, 18K rose gold bracelet. Water resistant to 50 meters.